Black Friday Special and through Dec. 2: $1.99 Four fascinating mysteries bundled together. Stories by authors Conda Douglas, Heather Fraser Brainerd, David Fraser, and Sara Jayne Townsend, and myself, J.Q. Rose, in a four mystery e-book set releasing from our publisher, MuseItUp Publishing. 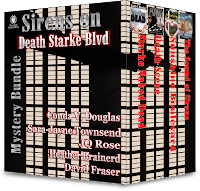 Jeweler Dora must become a sleuth to solve a murder in the first of the Starke Dead cozy mysteries series. Poking around in family closets produces skeletons. Mysterious deaths upset the Florida retirement community interfering with their seasonal activities and turning up more than dead bodies. Thanksgiving dinner with the family can be murder. Especially when someone is actually trying to kill you. You can order now and get the special Black Friday price-- $1.99 for ALL FOUR BOOKS. Price goes up on December 2. For more information and the buy link, go to MuseItUp Publishing. Also available at amazon and major online booksellers. 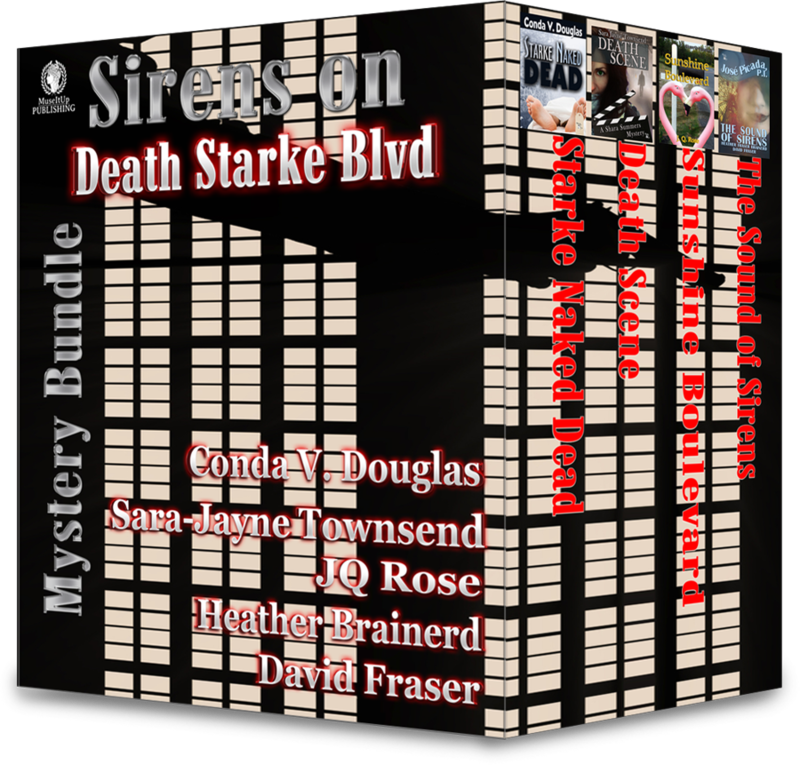 I am thrilled to have Sunshine Boulevard included in this bundle of suspense, mystery, and mayhem filled with twists and humor. Today the "bundlees", authors in the book bundle, are getting together to talk about our books. Please hop on over to their blogs to meet all the authors and discover their books. Sunshine Boulevard is a fun mystery with some quirky characters and situations. Readers ask me what inspired this story. The inspiration for writing Sunshine Boulevard comes directly from living life as a retiree in that beautiful state. When we were in the floral business, January was a slow time in the greenhouse and floral shop, so we took our two daughters to Florida to enjoy the tropical flowers and foliage, the beaches, and warm breezes. We gloried in the sunny skies after experiencing the gray, dark Michigan winters. We grew to love the people and places in Florida. After selling our flower shop and becoming empty nesters, we set off on an adventure traveling in our RV as full-timers. We spent our winters in campgrounds all around Florida. After eight years in our fifth wheel, we settled in a retirement community and enjoyed the life of snowbirds living in Florida in the winter and spending summers up North. We have met some real characters in our travels. So it was only natural to combine those personalities and place them in Florida, famous for its quirky crime and unbelievable events. You may not think a retirement community could have much excitement or action for a story. But, you are so wrong! You'll have to read this mystery with elements of suspense, horror, and humor to discover what I mean. Thanks so much for stopping by. Please leave a comment below and tell us if you are a mystery lover. Thank you! Sunshine Blvd is a super fun, quirky read. I'm happy to be bundled up with it this winter! Thanks, Heather. Maybe some of that Florida sunshine will peek out through the pages of Sunshine Boulevard and warm you up this winter!! One of the things I love about being in this bundle is the other great reads bundled with mine, what fun!